On the 100th anniversary of the end of the 1st World War, Veterans for Peace bring together English, German, French, American and Israeli veterans at the Cenotaph under the banner "NEVER AGAIN". 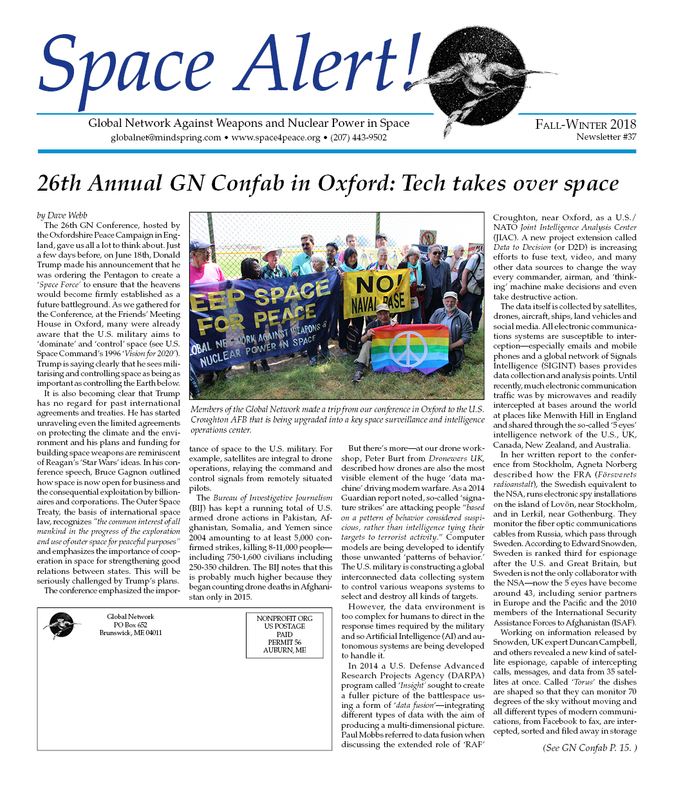 Latest edition of Space Alert! 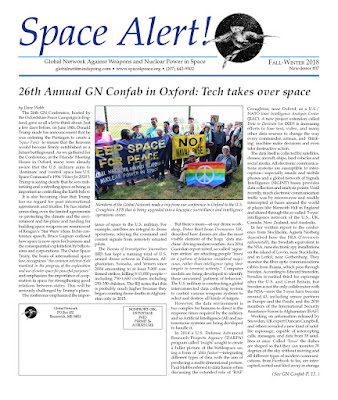 Our latest edition of Space Alert! is now at the printer and should be in the mail soon. If you are not on our mailing list and want a copy sent to you in the post just drop us a line with your street address at globalnet@mindspring.com and we will send you one. We are also happy to send you multiple copies in the mail to share with others. All we ask is a donation of your choosing to help cover the postage. Stop the war in Yemen! Military.com reports that as of August 31, US tankers like the KC-135 Stratotanker had dropped off incredible sums of fuel to other aircraft, citing data from US Central Command officials. An unknown — but likely high — number of recipient aircraft have been Saudi coalition jets bombing the Houthi Shia militia forces in Yemen. Yemen’s Ministry of Education, based in Sanaa, estimates that the Saudi-led coalition has destroyed at least 3,000 schools and partially damaged 1,300 others. Yemen once boasted 9,517 primary schools and 2,811 high schools. Today, the inability to pay teachers and staff combined with the systematic destruction of Yemen’s civilian infrastructure may lead to the shutdown of the country’s remaining schools. This video gives an update on the resistance to the Navy Fleet Review which was held October 10-14 in Gangjeong village on Jeju Island, South Korea. It is particularly directed to the friends around the world who fight against military bases and militarism, especially including those who gathered at the first International Conference against US/NATO Military Bases on November 16-18, at the Liberty Hall in Dublin, Ireland. No war in the Asia-Pacific! Will the Dems get real on climate? Varshini Prakash of the Sunrise Movement talks about why hundreds of activists occupied Nancy Pelosi's offices demanding a Green New Deal and an end to fossil fuel contributions to the Democratic Party. Good to see these young folks taking action. Wish they'd figure out the Pentagon impact on climate change too. The Watson Institute at Brown University (Rhode Island) released its report 'Costs of War,' revealing the astronomical sum of $5.9 trillion and well over 500,000 killed due to the never-ending so-called war on terror. The report was published on the heels of the news that the Pentagon failed its first and only audit. The U.S. war budget for the 2018 fiscal year that ended on Sept. 30 was over $700 billion. The Pentagon has never been interested in real fiscal oversight - there is virtually none in Washington. 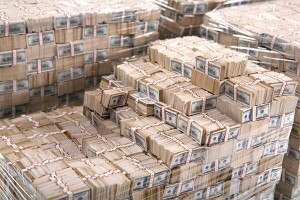 How could we ever forget the pallets of shrink wrapped $100 bills given to commanders to hand out to Iraqi soldiers to get them to sit out the resistance to US occupation? How many of those US field commanders stuffed the $$$ into duffel bags and carried them back home? Some reportedly bought new trucks and houses with the hard earned tax dollars of people who were working 2-3 jobs back in the US. 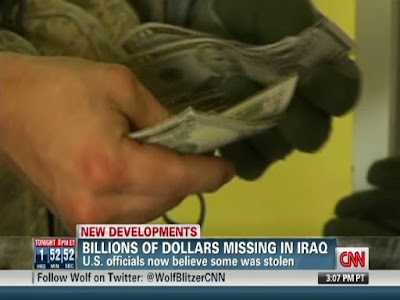 The irony is these thieves are called 'heroes' for their 'service' in Iraq. 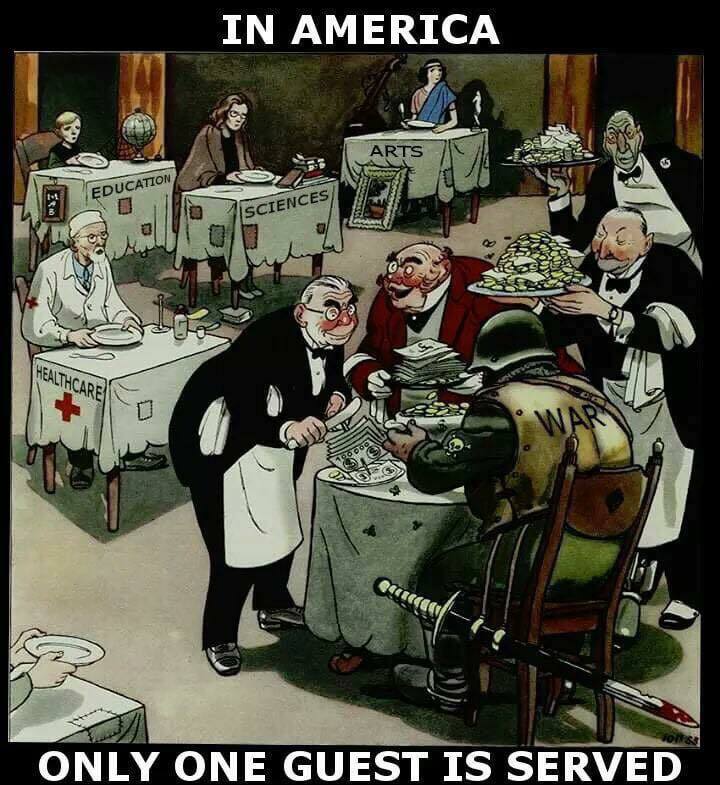 The entire war machine is one big criminal enterprise - being run by some of the most corrupt people in the world. Lucky for them they have one hell of an expensive Madison Avenue public relations campaign that keeps the American people fooled by hollow patriotism and a sense of exceptionalism based on distorted history and religious dogma. We are witnessing the internal collapse of the US empire and the corporate weapons industry response is to create even more wars (Iran next?) and demand unlimited spending on new plans (Space Force) to drive the arms race into the heavens. We live in a nation where millions of citizens are unhealthy and have been brainwashed to think paranoid and aggressive thoughts. Most of the world hates our government and wonders why the American people keep so quiet about all the corruption that surrounds us. I wonder the same thing as well. On Saturday MB and I drove a couple hours north for a meeting of peaceniks from that part of Maine. We discussed the next 'christening' at Bath Iron Works (BIW) and plans to hold a protest at the shipyard outside of that event. The date of the next destroyer 'christening' is not yet known. The theme of the protest will be to covert BIW to sustainable technology development which would allow us to begin to more effectively deal with our greatest problem on Earth today - climate change. Unless we immediately move away from fossil fuels - particularly making endless war - the future generations don't stand much of a chance to survive. As it turns out the Pentagon has the largest carbon footprint on the planet. Brown University (in Rhode Island) has recently done a study that clearly shows how we'd get more jobs if our nation converted the military industrial complex to sustainable production. See the study here. Does it not make sense to protect our children and grandchildren? Please help spread the word about this industrial crisis. Sign our petition calling for conversion of BIW here. Remember what the great abolitionist Frederick Douglass said, "If there is no struggle, there is no progress... Power concedes nothing without a demand. It never did and it never will." 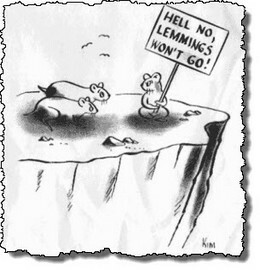 What is our demand as we face mass extinction on our Mother Earth? Recently the mid-term elections were held in the USA. The bottom line is President Trump strengthened his position in the upper chamber of the American parliament. He gained a majority in the Senate. It means there will be no impeachment. Trump will remain in office. But in the lower chamber of the Congress, in the House of Representatives, Trump lost his position. Now, he has a minority there. Since it is the Congress that determines the country's foreign policy, this means that it will be obviously impossible for Russia to agree on major issues with Trump. Trump has only a consultative role.